Popcorn sales, restaurant sponsorships, auctions, and garage sales. How do you stand out from the funding pack? What can you do that’s unique enough to catch the interest of people outside your social circle, even people who couldn’t care less about your cause? Here are 15 of our favorite creative crowdfunding ideas. At my church, a group crowdfunding for a mission trip had a boba milk tea (bubble tea) sale. Wildly popular. Simply brew tea, pour milk, drop boba, and add thick straws. Click here for cheap supplies. Think of the famous recipes in your community. Everyone knows a person who makes “the best” banana bread, best cookies, best cheesecake, etc. Skip the box mixes and recruit local baking heroes to create some truly delectable desserts to sell. A college club I was in held an event modeled after The Hunger Games, people hunted each other across campus for two days with Nerf guns. Confirm your “kill,” and the person is out. Last person standing wins. People pay an entrance fee, plus “sponsors” pay to give handicaps or upgrades to active players (an extra life, a restricted playing field, etc.). Have a creative people-person friend? Ask them to teach their craft — painting, cooking, whatever — to people who pay a class fee. “Sip and paint” events are popular. Wine, paint, stress relief … crowdfunding. So, your friend has a garage band and thinks they’ll be the next big thing. You agree that they’re pretty good. But they need some exposure. You just so happen to need some funds raised. Connect the dots. Maybe turn up the amp and host a battle of the bands. People commonly partner with restaurants or candy companies — with a portion of proceeds going toward a cause. Partner with a more unique business. That’ll catch eyes when you advertise your event. A nonprofit I work with is holding a rock climbing gym fundraiser; a portion of the day’s revenue for the gym will redirect to the nonprofit. Caffeine is a drug, but one busy society embraces. Feed the necessary addiction with coffee stands in highly trafficked areas, like in front of college campuses on Monday or churches on Sunday. We all have friends who love posting selfies of their workout progress. Potentiate that by hosting a strongman competition. They get the chance to show off in real life — it’s an easy pitch. You just need a good weight set. Ah, the classic “I’ll shave my head on Facebook Live if I raise X amount of money.” It’s an effective tactic, and doesn’t always involve a freshly bald head. Facebook Live is free and has far reach on the platform. Thanks to Instagram, there are more photographers than ever before. Collect photo prints or other types of art and have an art lawn sale. You can split the funds with the artists. Social media celebs with tens of thousands of followers are more easily accessed than Hollywood celebs ever will be. Consider celebs according to their interests (for example, a healthy-eating Instagrammer to help a vegan nonprofit) and ask them to shout out your fundraiser. You’d be surprised how loyal their followers are. It’s like Food Network’s Iron Chef, people who aren’t professional judges can actually eat the food. You can’t beat that. Charge a fee per plate, or have people put money in the jar representing the cook they think had the tastiest grub. Set out a jar for a few weeks in a building and put a sign that says to drop spare change in. Challenge people to fill the jar. Or have multiple jars and spark a “war”: the advertising part of your company donates into one jar and customer service donates into another jar. Loser cooks breakfast for the other team. Download the Sixpence app and create a campaign. Then, have people subscribe to your campaign. Every purchase in the U.S. they make with their credit or debit cards will round up to the nearest dollar. Those roundups — the spare change — really add up over the month. People are psychologically inclined to give more little-by-little than they would with lump sums. 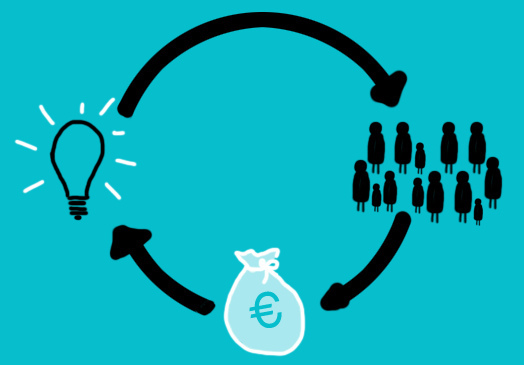 Let us help you with your crowdfunding efforts. Learn more here.